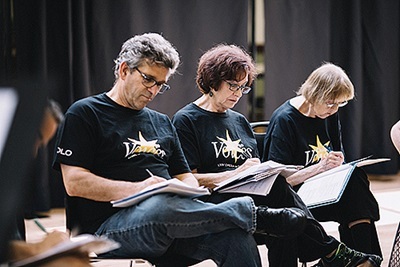 Note: this post originally appeared on the Lyric Opera's Chicago Voices blog on June 9, 2017 as part of their Community Created Performances series. Returning to Chicago Voices as animateur for a second year I feel both bolstered by the experiences I’ve had so far and braced for unexpected twists and turns. A process like this is never the same the second time around. As a facilitator, you have to be on your toes: what worked last time may not work this time, and you’re bound to be met with opportunities and challenges that you haven’t seen before. We are now less than one week into this year’s experience, and I have just begun working with a new group of retired and semi-retired folks calling themselves the YOLO Boomers. An essential part of our first day together was the creation of group agreements. These are agreements for how we want to relate to one another and to our process while we are together in rehearsals. I love making group agreements because they always surprise me. Many of the usual suspects appeared on our list: “work hard,” “offer encouragement,” “no judgment,” “try something new.” But something else showed up that I hadn’t heard before, and it came from one of the participants in the Boomers group: “pass on life lessons.” At first I wasn’t sure exactly what he meant. He explained that since we were going to be sharing our own personal stories in this process, we ought to listen for the lessons therein. We added it to the list, though I still didn’t know how this idea would impact our process. Then we started sharing stories. We began with an improv activity and then moved on to more personal stories: brief anecdotes of being misunderstood, of people in our lives who surprised us with who they were. At the end of the session a woman from the group came up to me and handed me a story she had written for a previous project. She wanted me to read it, to share in her particular fascination with mermaids. “That’s yours to keep,” she said. I felt honored that she was trusting me with her work, and a bit surprised that I had just received my own personal copy. After all, we had only met four hours ago. But it occurred to me that we share our stories all the time. We give them away — and often for keeps — without even realizing it. It takes a good deal of trust to do this, and I think that can be easy to overlook. Our stories can be manipulated or misused: people can misunderstand them, use them to make us look a certain way, or hold them against us. And so we make an agreement. We agree to listen, to try to understand, to honor the story and where it came from. I look forward to continuing ahead with this group. Their energy is bold, daring, unashamed. As we move through the process, we will intertwine each person’s lived experiences into a unique group narrative. And who knows — we might even learn a few life lessons along the way.